The acoustic guitar is an intimate musical instrument. Its voice is best appreciated in small venues when the audience is there to listen and be carried away by its romantic tone. Be it flamenco, bossa-nova or the many musical forms that make up the classical repertoire, most of us have felt the seduction of the Spanish guitar sound. This doesn't mean that the sound of the acoustic guitar can't carry when played in a larger hall. Amazingly, great guitars can fill an auditorium when they have been made to have a clear voice. My style is to make light, vibrant guitars with clear vowel tone and balance over their entire range. I've been told my guitars are also easy to play and have a very comfortable neck. I specialize in making classical and flamenco guitars in the tradition of the European master luthiers of the past, such as Torres, Santos, Esteso, Hauser, Fleta and Bouchet. My guitars are fairly traditional, but you will find many modern options, too. Too me, knowledge of the properties of the materials is of utmost importance. That is why I use the best wood available and only use hide glue. Attention to fret-work and set-up make my guitars more playable and have great intonation. The french polished shellac finish highlights the natural beauty of the woods and is thin so as not to hinder the vibration of the instrument. Yet to make a great guitar one has to look beyond any one of these aspects and integrate them, in order to inspire the player who will use the instrument as a tool for musical expression, which in turn will inspire the listener. 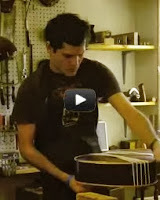 I also restore and repair guitars and other instruments. It is very satisfying to help a musician get the action right on their guitar or to revive a guitar that has been played hard, neglected or in an accident. One off the most common repairs are cracks caused by lack of humidity. Maintenance is very important for musical instruments and they must be kept at the correct humidity at all times. In my repair and restoration work I like to listen to a particular player's wishes and needs and follow from there. On the other hand, there are guitar players who play popular music in an amplified setting. When there is a complete band present or the venue is noisy and not meant for acoustic performance the only way for the acoustic guitar to be heard is by installing a piezo pick-up and/or using a microphone. The amplified sound is not meant to sound like the experience of listening to a guitar acoustically, but more as a good recorded sound of an acoustic guitar being played through good speakers. Some musicians also enjoy the versatility of getting different sounds by adding EQ or effects to their sound. I have always been interested in this and therefore offer installation of pickups for the jazz, brazilian, tango, trova, fusion, avant-guard or pop performing guitarist. I got started in luthery while in my late teens. Interested in the alternative way of life of the artisan I sought to find viable means to make my livelihood as such. Since I was playing bass it seemed natural to experiment on my own instrument and I discovered I had the knack for this sort of work. I began building my collection of tools, some of which I still have. All this time I always had in mind my ultimate goal: to become a luthier. Time has gone by. 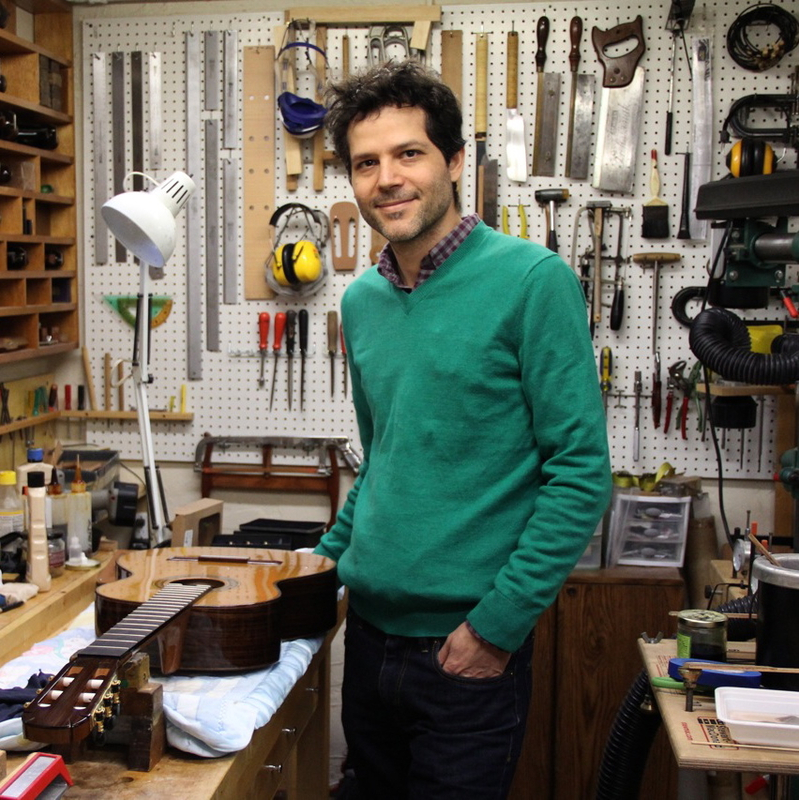 I completed a certified guitar-making course, followed by an apprenticeship, repair work and construction of classical, steel string and bass guitars. I've spent time with dozens of luthiers of all types, in the United States, Spain, Mexico, Argentina and my native country, Panamá. I continue to read all the books on guitars and luthery that I can get my hands on and I am a member of the Guild of American Luthiers. All of this cannot replace the fact that one learns to do anything by simply doing it: by experimenting and using one's heart, intellect and creativity to always make the best that one is capable of and by doing good work that one can be proud of. This is the essence of what it is to be a true artisan and is what I love the most about my work.